Archivist Dave Hyde has combed through the BBC’s radio archives for rare and undiscovered interviews with the biggest names in music of the last four decades. Highlighting discussions as recent as Adele in 2007 and as far back as Iggy Pop in 1976, RAW offers a pithy glimpse into the minds of stars rising through the ranks to become cultural mainstays. At 36 years old, you’d expect Bowie to sound fresh and ready to take on the world, and he does, but it’s seasoned with a profound precociousness - and a sense of humour to boot. So put on your red shoes! 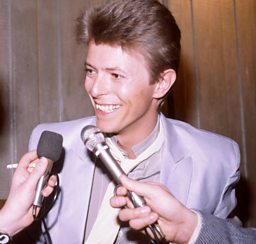 Here are five moments when this rare Bowie interview made us smile. David Bowie not only ushered in a new sonic era in 1983, but switched record labels whilst he was at it. A mutual disillusionment grew between Bowie and his then-current label, RCA. He claimed “There was no interest in any of my albums,” which encouraged him to move to EMI for a deal reportedly worth a whopping $17.5 million. During his time off, Decca and RCA reissued albums and released compilations in lieu of new material. It did more than provide a few chuckles, though. This was Bowie regaining control of his expressive output and curating his discography on his own terms. Kid Jensen asked the Brixton-born singer if he still considered London to be his home, and he said he thought of himself more as a resident of the world. As much as he tried to convince himself of that, he still couldn’t avoid flaunting some signature frankness, topped off with self-deprecation. It’s not all doom and gloom though, since he did quite like his version of The Who’s “Can’t Explain” on Pin Ups. David Bowie’s duets and co-writing projects were just as unpredictable as his music and myriad personas, including collabs with Queen, John Lennon, Bing Crosby – and Scarlett Johansson. Given his track record, one can only assume he loved working with others and had a list of musicians he was desperate to collaborate with, right? Bowie confessed to Kid Jensen that he’s “never really wanted to record with other people,” and that there is “absolutely no one” on his list of dream collaborations – before belatedly hitting upon famously insular Kraftwerk as a potential creative partner. This leaves us wondering whether Bowie was a soft touch, or just generous. Since being a musical wunderkind wasn’t enough, David Bowie was also an accomplished thespian by the time he did this interview. Having previously starred in avant-garde theatre productions, movies and short films such as Lindsay Kemp’s play Pierrot in Turquoise - and alongside Marlene Dietrich herself in Just a Gigolo - Bowie portrayed John Merrick 157 times in the Broadway production of The Elephant Man from 1980 to 1981. Of course Bowie went on to play plenty of non-alien non-limpers - but it took him awhile to get there. “Let’s Dance” was a viscerally joyful departure from what David Bowie’s previous work, which he described as “not quite so icy” and reflective of his “own personality at the time, unfortunately” to Kid Jensen. He wanted to carry that over in his Serious Moonlight tour too, parsing what “serious moonlight” meant to him and others, and how it could manifest in the form of a stage show. Aww. We don't really know what it means, but - aww.